Two-year project completed in the fall of 2018, consisting of local roadway rehabilitation work including installation of new bike lane infrastructure in an urban environment. 83 Ave is located in the heart of Edmonton’s Whyte Ave District, providing unique challenges that required creative and proactive solutions to achieve positive public engagement and feedback. 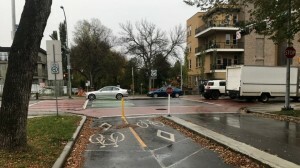 - New bike lane infrastructure including median slabs and delineators. 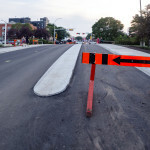 - Installation of stamped asphalt crosswalks and intersection details. - Topsoil and sod placement and park space construction in residential area. - Installation of community signs and features including entry features and benches. - Public engagement and traffic accommodation during construction.